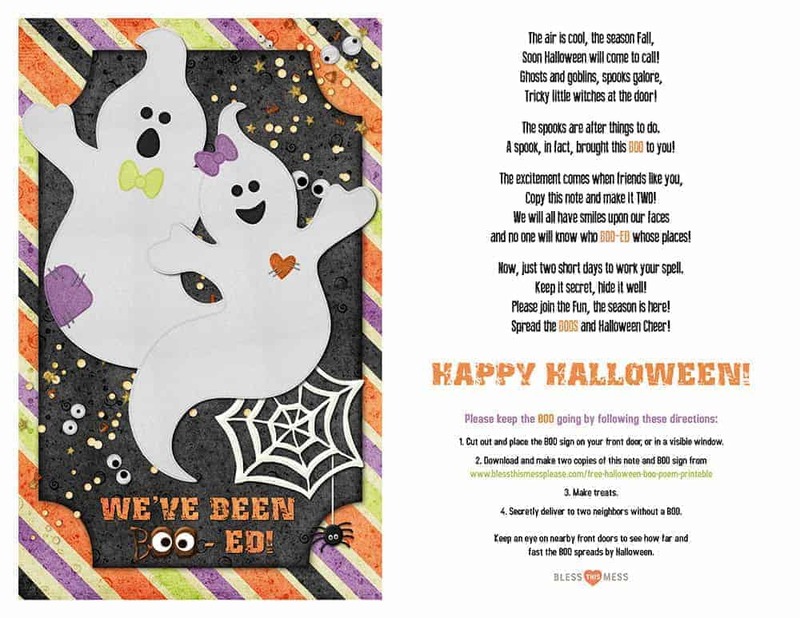 Free Halloween Boo Poem Printable for leaving treats for your neighbors this Halloween season. Doorbell ditching has never been so fun! Happy Halloween season friends! When October rolls around, the traditions start up. One of our very favorites is “booing people” as we call it in our family. What “booing” entails is making treats and then doorbell ditching them on friends, family, and neighbors’ front steps. This is a really fun tradition that my kids look forward to every year. I love it, too! I feel like it’s a great way to start on some holiday baking (without eating it all ourselves) and it’s a fun way to help your kids think of others. After an afternoon of baking or treat-making, we all pile in the car. The kids all pick friends, family, or even their school or church teachers to “boo” and then we start our adventure. We normally scout out the house on a drive by. Then we park somewhere out of the way. Dad takes the kids (carrying the littlest ones) and they leave the treat on the door, knock, and run! I’m normally the get-away driver. Every year I end up searching the internet for a cute free Halloween boo poem printable. I decided this year that I should just have my friend (and favorite printable maker for Bless this Mess) whip up a cute printable for me to share with you. Thank you Dede! You can see her other handiwork and visit her digital scrapbook shop here. You get a cute printable and I get to stop looking for one every year! Need some inspiration for treat ideas? Here are some of my favorites. All things popcorn are a good idea on my list. They make a big batch (so you can “boo” lots of people) and it’s pretty inexpensive to make. Plus, I adore all things popcorn. This gooey caramel corn recipe is my mom’s and one of my favorites. It’s sticky, sweet, and oh-so-perfect. This gooey marshmallow popcorn is a lot of fun, too. Replace the sprinkles with halloween colored sprinkles and the Christmas M&M’s with Reese’s Pieces or candy corn. Homemade Butterfingers – did you know that you could make them at home? It’s really easy and a lot of fun., plus you only need three ingredients – candy corn, peanut butter, and chocolate! Candy corn snack mix is the stuff my snack dreams are made of. Place some of this in some festive baggies and you are good to go. SO EASY! No-Bake Fluffernutter Cookies (or Ritz cracker cookies) are one of my favorites! So easy to make and dress up with seasonal sprinkles. Magic Cookie Bars are always a hit, and bar cookies are a great idea for something like this. Just replace the Christmas M&M’s with Reese’s Pieces or candy corn. Those are some of my favorite simple treats to make (and eat) which is just what you need to get you started on your own “booing” adventure! I hope you start this tradition with your own friends and neighbors ASAP. It’s so much fun – we look forward to it every year.